Got it. I’ll get myself a MacBook! 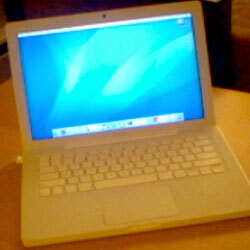 So there you have it – I have bought myself a MacBook for the sole purpose of testing websites with Internet Explorer. Well that’s not quite true. I wanted an Apple laptop for quite some time, but I didn’t really need one. My Linux powered laptop has performed well over the last 3 years. In fact, I would have probably continued on with it for a while yet, if it wasn’t for this work related necessity. A MacBook is a wonderful development laptop. The hardware specs are an amazing improvement over 3 year old state of the art. It puts me in the very enjoyable and very productive OS X environment. And BootCamp makes dual-booting into Windows a snap. It’s been a while since I was this excited about getting a new piece of technology! What? Your old Sony laptop did not perform well at all! It was prone to suicide, (at least in my custody) the mousepad would randomly click on things and it had a battery life of like.. 2 hours. I think the Mac laptop is a huge improvement! Sony’s occasional death was a hardware problem – I’ve had the motherboard replaced shortly after I got the laptop back from you. You’re not supposed to rest your hands on the touchpad. It’s a three year old battery – what did you expect? that’s one of my reason. I didn’t rest my hands on the touchpad. I would move it with my finger.. and it would click on everything that was on its path. This wasn’t just a problem for me either. And considering that laptop cost you over $2000 if I recall correctly, yes I expect a better product! my only question is: if you had a pc laptop running linux, couldn’t you have installed windows on that machine and dual booted? if you were using parallels, it might make more sense. but hey, macbooks are shiny and beautiful, congrats. I’ve had no problem with Sony’s touchpad. And I’m pretty sure we’ve already had this discussion. Chris – actually I couldn’t. Oddly enough Ubuntu came with better graphics drivers than WIndows XP did. I could never get the latter to work properly on that laptop. VMware runs acceptably on my three-year-old laptop. If your *only* use is testing sites in IE, it would do the trick. Of course, VMware Fusion on OS X rapes everything. SO GOOD. Try it if you haven’t yet. I actually tried VMware on my Linux laptop, though that didn’t work out well. VMware Fusion looks sweet though – I’ll give it a try. Oh, and the blury pictures are from my webcam. I’m actually looking for a new digital camera – got any suggestions? Preferably Canon. I’ve been getting around to buying a digicam myself since July or so. The task seems to suffer from constant re-scheduling to a later time. This probably means I will be able to offer plenty of suggestions around exam time when I am procrasting, but not right now, sorry. VMware itself worked – that is, it booted Windows. Though it was slow to start up, slow to work, it had limited resolution, and Windows had trouble figuring out its network settings. And.. you’re not pracrastinating for your midterms next week? I think I’ve already filled my procrastination quota for the midterms… Six weeks sounds enough. Just say it, you were looking for reasons to buy Mac . I’d probably go for one as well. The hardware seems worth it. For me, I over spent on hardware luxury past few months when I finally made up my mind on Sony Bravia LCD with it’s surround system after the wall in my living room was crying for one, and after hesitating for one whole year. It’s a perfect place for LCD and surround system. Ofcourse once you spend on initial high quality, you must pay for all that goes with it. I got the PS3 (to complete the collection) HDMI Cable for Video, and optical Cable to the surround system. 2- Games: I am a gamer and Plasmas have this score print lasting on the screen. It was expensive, but after a time of using it, well even my wife admires what PS3 does on that HD screen. Heh, I’m tempted to get a better TV for my Wii (I currently have one of those older CRT varieties), though I don’t think that it’s current limited use will justify the expense. At least not at the moment. I’m still a student, remember? The settling is a long way off. As a developer, and a CTO I needed something a little more businessy than Linux (ie: I needed Windows), so I got a Macbook as well and run Windows XP in Parallels. I’ve never felt the need to dual boot, Parallels does what I need very well. Granted, by use of Windows stuff is pretty light, but there are times when I’m very happy to be able to load it up to get what needs doing done. Have been a developer on Linux and BSD systems from some 10 years now, I’m still getting used to doing things the Mac way – but I’ll get there. Oh you’ve become one of them now! I have to sit and listen to the Mac people why their computers are so great and why my Compaq is junk for a small portion of each of my day. Please don’t become one of those people! every computer has it’s function, it depends on your own requirement. such as : i’m tired of antivirus updating, and a Mac does make my life quite easier. ahh..i think you were pre determined on buying one.. I would have gone for HP series.. They have good specs too and lot cheaper than Macbook Pro(Which I am really fond of). LOLz anyways that’s nice to have a new logo on a personal laptop.. the apple one.. Personally but for the price, i would like to have one of those. I know that this blog post of yours was posted a while back, but thought I would share with everyone – Browser Shots! It is useful for those who can not afford or do not wish to purchase another computer from just cross browser testing.